Your home can get pretty warm, even during these Florida winters. You may assume that your ac and free-standing fans will cool your home entirely, but that bill in the mail says otherwise. Did you know that your window treatments can save you money on cool costing? Find out how you can get the most efficient window treatments for your budget. Interior and exterior shutters are beneficial for all weather types and are customized to provide shade from additional heat. Shutters are a popular choice, especially in most heated climates. They are also a number one choice because of privacy and glare. Shutters add security, weather protection, and less use of interior space. With exterior, they need to be sized exactly to the architecture of your home and this is something that can be accomplished with the help a professional. These energy efficient shutters are fitted to the interior side of the window and offer an aesthetic appeal. They come in wood and vinyl, which offer insulation benefits to your home not just a cozy feel. In this feature, wood is probably the most beneficial choice for cooling the home. This type of shutter fits the frame of the window perfectly and will keep any access heat out. Florida has its gruesome summers and chilly nights, but even during the coolest days, the midday sun can get a little unbearable. Shades provide insulation for when it gets too hot and provide adequate amount of glare control to keep the room from rapidly heating. Drapes offer a cooling benefit throughout your home because the heat gets lost in the folds and pleats of the drapes against the window. Not only can you choose from just about any style and color drape for your windows, you don’t have to worry about the drapes losing their effect. With drapes, you can expect an even temperature room and a variety in color and style. Preferably, white or medium-colored drapes reduce heat gain by 33%. Interior and exterior blinds offer excellent energy efficiency throughout your home. 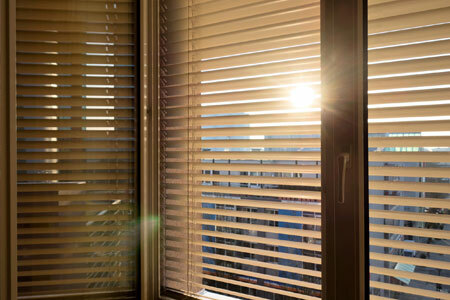 Compared to shades, blinds reduce heat gain by 45% and the slats can easily be adjusted to control the ventilation and light. Exterior blinds are made up of weather proof materials such as aluminum, vinyl, wood, and steel to reduce the heat effect in your home. Again, even exterior shades allow partial light and heat into a room without a flood of hot air filling the house. Depending on what you chose to cover your windows, you may want to invest in high-reflectivity film that helps block the heat during those hot summer months. These films offset the reduction of heat, equalizing the temperature in the house without costing a great deal to add to any window. Your investment in window treatments may be energy efficient and cost-effective each month so call your local contractor today for an estimate on how you can get the most out of your window installations.